Included are new bench seats for fighting compartment, which can be shown folded up, new driver seats with cushions, ammunition and equipment boxes, two alternate sand sack packs for front machine gun mount, canvas folded, rolled or partitially opened and other interior parts. For additional outside equipment the set contains fuel cans, wooden jack and other equipment parts. Also included are a small and wide timber rolls, Notek camouflage and convoy tail light and Brass turned position marker rods. 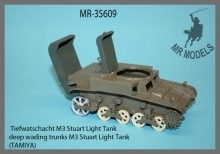 The parts of item MR-35600 are designed for the armored variant of the Sd.Kfz.251 Ausf.A, as featured in the ICM pastic kit, but can be used for scratchbuilt models of the non-armored variant of Sd.Kfz.251. 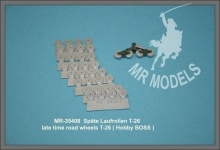 No special parts for the unarmored type are included in our product. This Product was added to our catalogue on Tuesday 22 May, 2018.